There are four main types of Qigong healing practices: Qigong exercise, Qigong meditation, Qigong massage, and Qigong healing. Qigong exercise combines movement, breathing and visualization to cultivate the body's energy. For Qigong meditation, the body is usually stationary and the practitioner incorporates visualization and breathing to move and store the energy. In Qigong massage, physical massage techniques are used to cultivate the energy in the body, not just to relax the tension in the muscles. 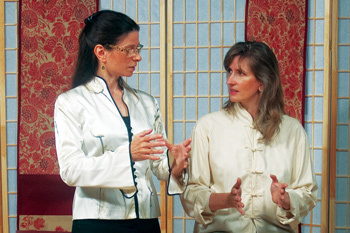 With Qigong healing, visualization and physical techniques are utilized to improve the energy flow inside the body and can be done on yourself or a partner. 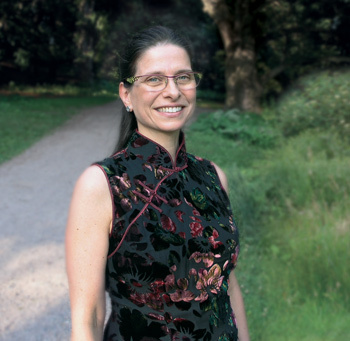 A Qigong Therapist is someone who has extensively studied Traditional Chinese Medicine (TCM) and learned many exercises, meditations, and healers' techniques in order to efficiently correct any health concern that arises. The energy that flows through your body is supplied through major pathways called meridians. There are twelve pairs of meridians, symmetric on each side of the body, associated with the twelve major organs in Chinese medicine. Each of these meridians connects internally to its organ, connects the organs to each other, and branches out through the whole body into smaller and smaller channels to supply energy to each individual cell. The meridian pathways also allow the body's energy to balance with the environment. We get into trouble when this energy flow gets interrupted, and our bodies can be affected physically, mentally, emotionally, and spiritually. When something interferes with the energy flow it is called a blockage. These blockages can be caused by external environmental effects like bad posture, physical trauma to the body, and pollutants or by internal environmental effects such as emotional or mental stress. In either case, the result is the tissues of the body now have an area that has poor circulation and will have more difficulty maintaining health. You can think of each cell like a factory. If the factory gets proper supply of electricity, it can make the products it is supposed to make. If our cells don't get proper energy circulation, they can't function correctly. Qigong is a method for removing these blockages and improving the energy circulation and supply to the cells of the body. Qigong healing involves sensing the energy blockages, clearing them out of the body, and sending outside or environmental energy in. It can be done on yourself or a partner. The actual Qigong healing session only starts the healing process. The long-term improvement in a person's health comes from regular and consistent self-care. You can think of the energy blockage like a huge rock that has rolled into a stream. When the rock rolls into the stream, the water will deviate and flow around the rock. The rock is then causing some areas to not get enough water and others to get more than it should. Removing the rock is necessary to return the flow of water to its original path, but it is not enough by itself. If the water has been deviating for a while, it will have worn deep groves into the earth and not easily be shifted back to its original path. The goal of Qigong is to both remove the rocks and/or blockages and retrain the energy to flow along its original proper path. A Qigong healing session manipulates the energy flow within the person to return it to the proper pathways. Qigong exercise and meditation are then recommended afterwards to reinforce the retraining process of the correct pathways. Without these, most people's energy will go right back to its old pattern of illness within a few days after a Qigong healing session. Our job as Qi healers is to jump-start start the healing process through Qi healing, instruct individuals in the best follow-up exercises, and inspire people to get involved and change lifelong habits that undermines their wellness. Our health picture is affected by our lifestyle and the interventions we choose, with lifestyle having the biggest effect—70 percent—and interventions a smaller effect—30 percent. Lifestyle represents the things we do all day, everyday — nutrition, movement, mind set. Interventions are the things we do occasionally —healing treatments, medications, herbs, going to the gym. If both our lifestyle and our interventions are heading us in the right direction, we will become healthy very quickly. If they are going in opposite directions, lifestyle will always dominate even if the interventions you choose are extremely powerful. Our lifestyle builds our health status, brick by brick. Through the things we do every day, we set the path for the energy flow within our bodies. The status of our health isn't created overnight, it is built over years of repetition of our habits. To improve our health takes consistent effort over time to change that energy flow. Qi healing is an intervention because it only happens occasionally. When a person repeats Qigong exercises several times per day, they have now shifted into a place where they can permanently retrain their energy flow. Qi healing can really jump-start the healing process by removing the blockages, but the retraining is necessary to hold onto the changes. Lasting change can only happen with creating a lifestyle that supports health. We use up energy as we live our lives. There are two natural ways that Qi is added to our bodies on a daily basis. The air we breathe brings in Qi through our lungs and the food we eat brings in Qi through our stomach. As Qigong practitioners we can also bring in Qi directly from the environment into our bodies through meditation and visualization. There is an important principle in Qigong that where the mind goes the Qi follows. The mind leads the Qi. Through training the mind, we can direct the Qi. But, we have to remember that more is not necessarily better. We have to understand how to add in this energy effectively and appropriately. As Qi healers, when we send energy into an area we want the energy to come from the environment and not from ourselves. When working on yourself, this is not as critical as when you are working on someone else, but it's best to have a good habit in place for sending energy. To have the energy come from outside of you, you have to visualize it that way. If you just have the intent of sending energy without specifying that it's coming from outside, it will be your own energy. Remember that the mind moves the energy and wherever the mind goes the Qi will follow. It is natural for people to send energy. Every time we think about someone we are sending him or her energy. If you want to do Qi healing safely, you don't want it to be your own energy. You have to add in a visualization of the energy coming from somewhere else. The following is an example of how a Qi healer would guide Qi from the environment into someone for healing and can be done on oneself or a partner. The goal of this technique is to increase energy circulation through an area to flush out blockages and promote healing. It is quite effective for pain and commonly used on the joints of the body. Qi healer balloon technique can be done on any area of the body. This example uses the knee as the point of focus. You would always flush energy out through the foot if you were working on the leg or torso, and out of the hand if you were working on the arm. If you are working on the head, you could choose either the hand or the foot to flush out the blockages from the body. Visualize your knee as if it were the shape of ball. Inhale and picture energy from the universe flowing into this ball filling it with a color, like a balloon inflating inside your knee. Imagine that balloon inflates much bigger than the original knee. Pick any color that comes to mind. If your knee tends to feel hot all the time, pick a cool color like blue or green. If it tends to feel cold or ache when the weather gets cold, pick a warm color like red or yellow. Exhale and picture this balloon deflating much smaller than the original knee and see that color wash down the whole leg and out of the body through all five toes. Repeat with each breath that you take. Inhaling the color from the universe into the knee and exhaling it down the leg and out all five toes. Stay with the visualization for as long as it feels good. You should get a nice, dreamy kind of feeling as you repeat this over and over. Repeat several times per day.